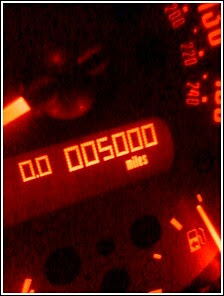 After only 4-1/2 months, my Odometer turned over to 5000 miles the other day. Now, this is actually an interesting achievement considering on my first MINI, it took almost a year to accumulate that feat (true story!). Well.. *I* thought it was interesting anyway. I mean, isn't that a song or a movie or something? I noticed something interesting as I was heading southbound on the I-15 the other day. Even from a distance I knew I was about to see something you don't see everyday- I justs didn't know quite what that was going to be. 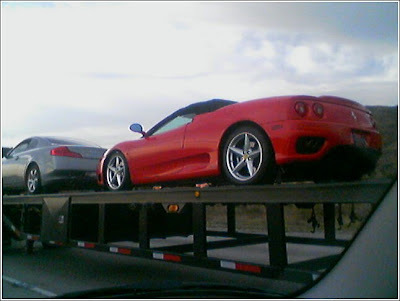 As I got closer, I saw not one, but two Ferraris- on an auto-hauler (whatever those things are called). Since I'm not a "Ferrari guy", all I can tell you is that one was yellow, and the other was red. (Yeah, there was a Lexus on it too but who cares about a Lexus?!). I grabbed a photo w/ my crappy kamera phone at approx. 70mph. Because I can. And I thought it was pretty. Just when i think I'm doing okay, I'm reminded that i still don't really understand humans people. I know MINI owners have a reputation as fun and friendly folk, which is true, but sometimes it gets a little too much for me. 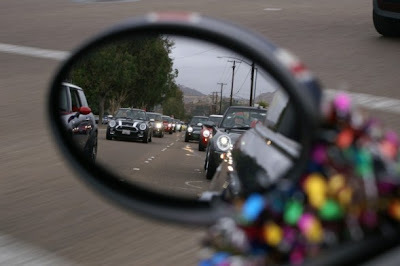 1,000s of beautiful photos of MINIs in head to head competition. 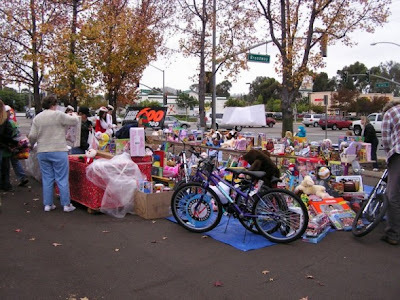 Photos are starting to roll in from the Toy Drive. 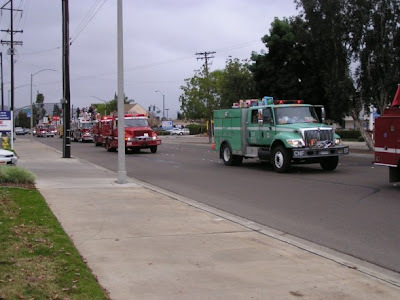 there were about 10 fire trucks! yeah, we kinda stole the show i guess. 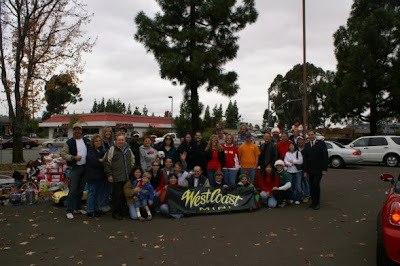 Special thanks to WCMers Chris and Sandy for the photos! It's another MINI Adventure! 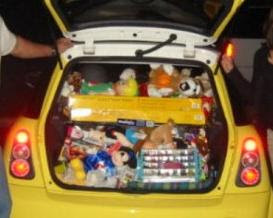 "Toy Drive"
The West Coast MINI Club participated in thr Toy Drive for well-deserving "East County (San Diego) kids for the second year in a row. I'm not even from San Diego so that makes it even more exciting! Early the next morning (and I do mean early!) 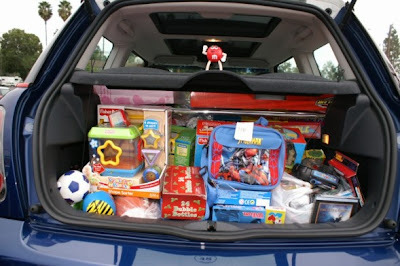 we emptied out her car and crammed and amazing amount of toys in the MINI! 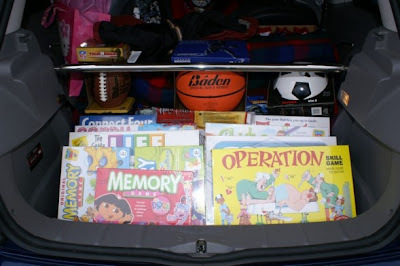 (and she still has some left in her car, simply because we ran out of room!) 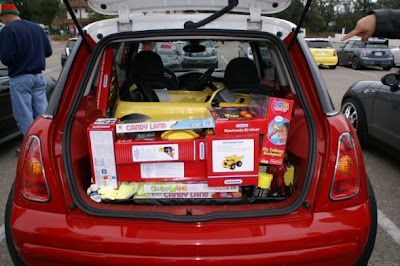 You'd be surprised at how many toys you can jam into a MINI Cooper, even with a driver, co-pilot, and a 3-foot passenger! 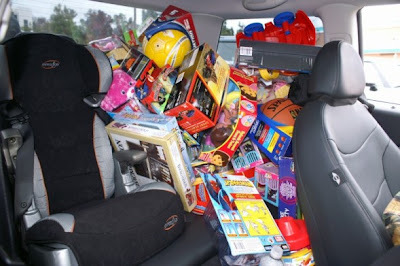 50-60 toys later we headed out! 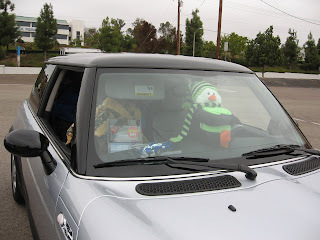 The next phase of the adventure was to rendezvous with a one couple in a MINI at an offramp about 20 minutes away. 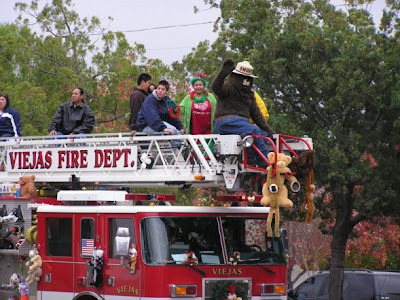 They showed up like clockwork and we were on our way. I wasn't driving like maniac but they soon fell behind. (sorry?) We didn't worry because they knew where they were going. We, on the other hand, followed Google's impeccable directions to the letter! We got the McD and I said "first one's here!" 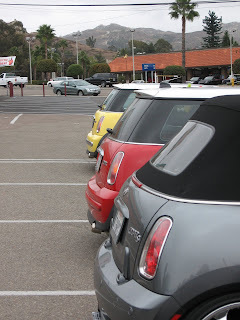 About ten minutes later, with no one else showing up, I'm thinking "um, where's the rest of the MINI's?" 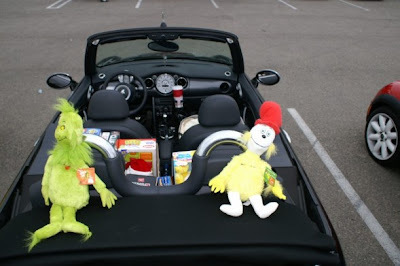 I called up MINI Steve- it turns out Google gave us excellent directions- to the WRONG McDonalds! (notice how I attempt to shift any fault away from myself!) 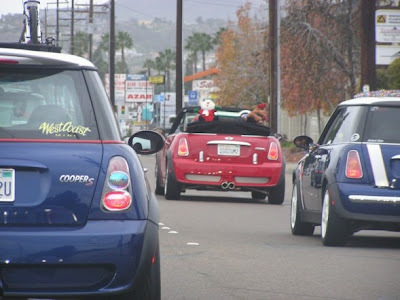 No worries- we headed up to the right McD and there were about 10 MINIs waiting for us! 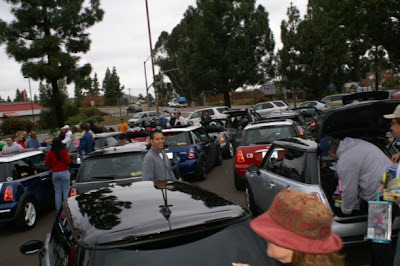 About 20 MINI's deep, we caravaned about two miles to the drop off point (later we found out it's illegal to caravan in El Cajon! It's "right up there with street racing"? Who knew!?) 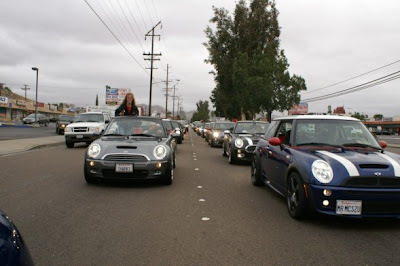 I didn't know there was going to be a radio station there, but as we pulled up, we could hear them on the radio saying, "OMG- look what just pulled up- about 20 MINI Coopers!" 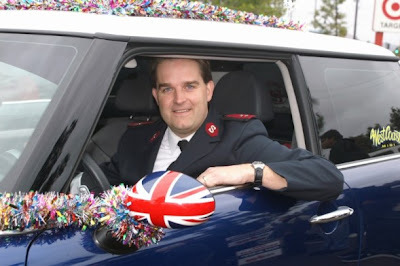 (Insert every MINI joke you've heard 1000 times by now). 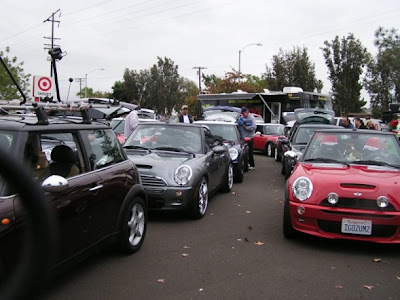 Next stop: Off to lunch with the MINI group where we took over 1/2 of an italian restaurant. Then it was back home in damp weather and a TomTom u-turn glitch, but of course, Mr. Bigglesworth handled it with no problems. Now, for a well-earned nap, and to close the book on another MINI Adventure! I am happy to announce that Mr. Bigglesworth has returned, 98% restored to it's original pristineness! Turns out there was minimal body work needed and no paint involved. The rear right suspension was completely replaced as well as front control arm (the parts list is quite daunting). 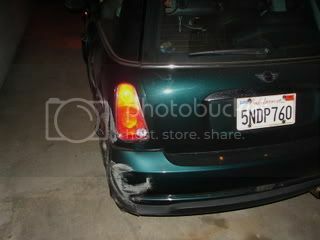 They also replaced all the black molding on the passenger side and front bumper. They also forgot to replace the jack support stand which was ripped from the frame and thrown who knows where. Can't blame em though- I can't find this item in the parts book! I got it back on Friday and only those two not-so-little oversights. I don't notice any sign of painting but this morning I noticed the sill on the passenger side has scratches and dings in it that weren't there before. Should I complain about that? Other than that, they did a pretty good job. I hope I don't notice more "slight aberrations" in the coming weeks. *Best and worst predicted reliability, according to Consumer Reports survey research. Ongoing demand for this thrifty gas/electric hybrid and excellent reliability give the Prius the best depreciation rating among all currently sold models. 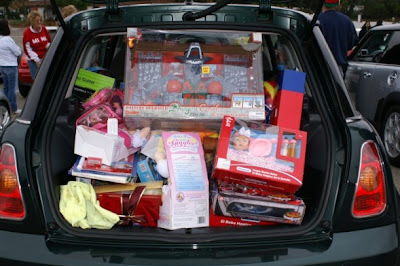 In addition, many owners are hanging onto them, so good luck trying to find a used Prius. $22,000. This trendy, fun-to-drive retro-hatch/convertible has generated a cult following reminiscent of Volkswagen’s Beetle. While the reliability of early models was below average, it has improved to average in recent years, according to CR’s Annual Car Reliability Survey. $17,500 to $25,500. This boxy wagon has love-it-or-hate-it styling, but it provides a spacious interior, stingy fuel consumption, good reliability, and a low price. Scion is Toyota's youth-oriented brand. $14,000 to $15,000. The limited-edition, tuner-developed M3 is the perennially popular high-performance model in BMW’s 3-Series line. A fanatical following and legendary performance mean that used M3s command premium prices. About $49,000 to $56,500. Among the top SUVs in Consumer Reports Ratings, the RX is plush, quiet, and comfortable while providing better-than-average reliability and good crash-test results. The RX400h hybrid is among the most fuel-efficient SUVs we’ve tested. $36,000 to $46,000. Available as a coupe or convertible, the 6-Series is based on the 5-Series platform. But its more limited production helps keep its resale value high. $72,000 to $79,000. A different SUV from the Lexus RX, the GX is a traditional truck-based, off-road-ready vehicle. 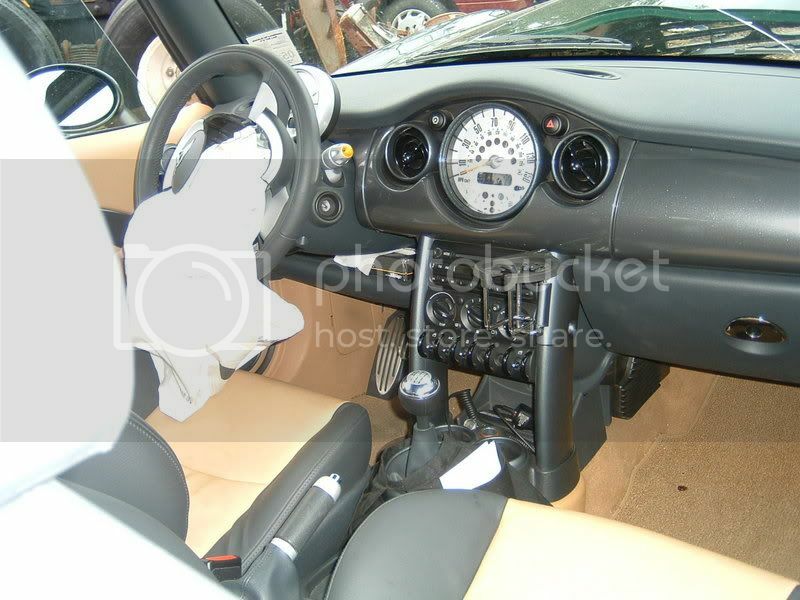 It has above-average reliability, a well-appointed interior, and good frontal offset crash-test results. But resale values might not continue to hold up as well for the GX as demand softens for body-on-frame, V8-powered SUVs. $46,500. Providing a nice balance of sportiness and comfort, the well-rounded TSX provides above-average reliability, good crash-test results, and a long list of standard safety equipment. $28,000 to $30,000. The small xA hatchback looks much different from the larger xB but shares its low price, good reliability, and excellent 30-mpg fuel economy. $13,000 to $13,500. A longtime Consumer Reports recommended model, the Civic offers outstanding reliability, good fuel economy, and good crash-test results. While the Hybrid version returned an excellent 36 mpg overall in our tests, even regular Civics do well in our fuel-economy tests, with 29 mpg for the automatic. $14,500 to $24,500. 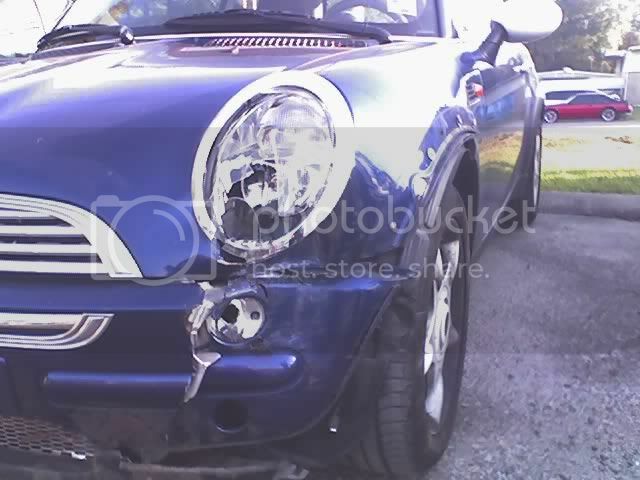 More dented MINI surface after describing the events of what I'm calling "The Curb Incident". 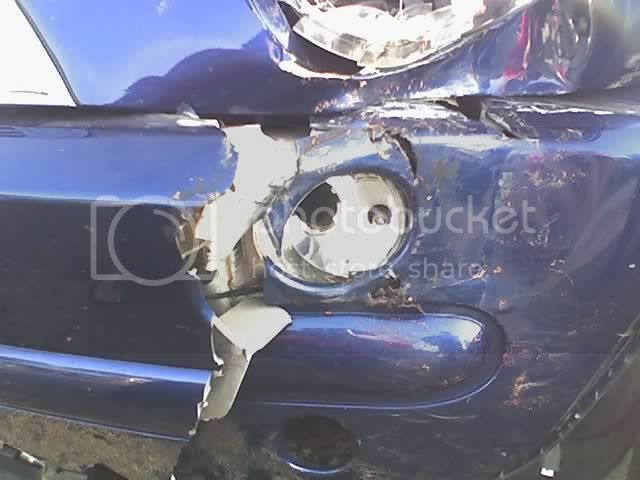 This owner writes, "You're lucky to have gotten in a crash that fast and not have that bad damage. I hit a wall at 80mph sideways and my car was in shambles..."
"i owned handsome rob for 44 days and someone smashed into me..."
me: "hey good morning- i just wanted to see if you thought you'd be done before or after the long weekend?" So, how *do* I put this? How about "AAAAAAAAAAAAAAAAAAAHHHRRRGGGHHHH!!!" Tune in for the next episode where you might hear Bushfinger say, "So- does this come with a CD Player?" Graphical representations courtesy realoem.com and may not depict actual parts used. Let's Be Careful Out There! Okay, How Do I Put This? Somehow the back end lost traction and spun a 180, finally slamming into a curb on the other side of the road at about 70mph. It managed to hop off the street, over the curb, and into a dirt field. 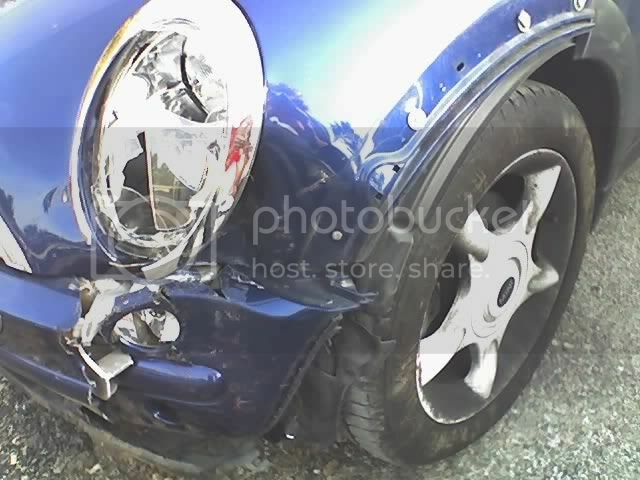 is almost no body damage that the average person would notice ( (front right a-panel, plastic body moulding, front right fender, rear right fender... *I* notice! 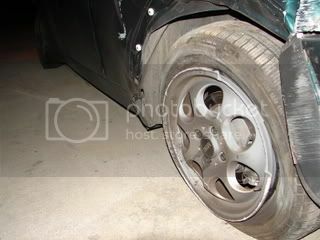 ); The curb took a chunk out of the rear rim and severely tweaked the front one; alignment is non-existent. 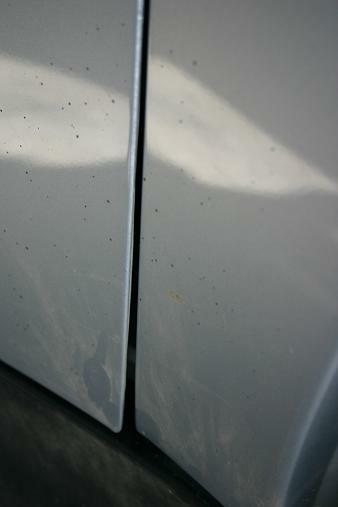 All passenger side plastic body trim sustained damage. The rear tire is rubbing against the frame so hard it made a pile of "rubber dust". The hit was strong enough that the wiper fluid reservoir apparently cracked upon impact. The jack stand support and who knows what other under-carriage bits got torn off and flew into the dirt. I didn't take inventory. I got home before my non-runflats went flat! 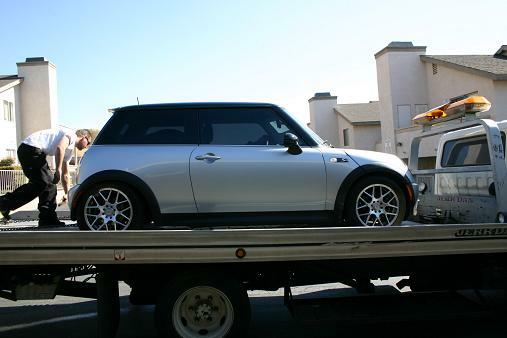 It got towed to the body shop recommended by the insurance company this afternoon. I'm fully covered (or so they say). While mild and a yawner in comparison to other recent MINI-crashes, my instincts tell me it's going to end up much worse than my untrained eye can see. I don't have a repair timeline yet. My fingers are crossed. 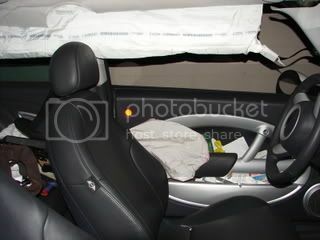 Here is an opportunity to share a learned lesson: Even in one of the best handling cars on the market, there is no excuse for driving like an idiot. Please spare the sympathy. 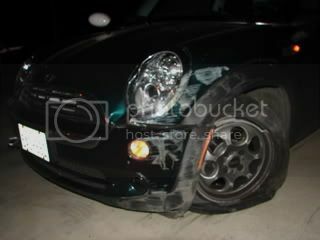 It was totally my fault and a blatant reminder that the world is not a race track. At the expense of my reputation as a good driver, I'll be chronicling these events for posterity on my blog and gallery at irieman.com/mymini. 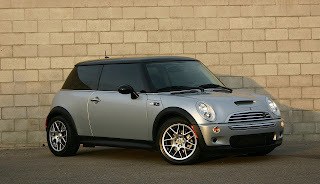 PS: I apologize to the MINI community for contributing to higher insurance rates. Losing control of your car on wet pavement is a frightening experience. 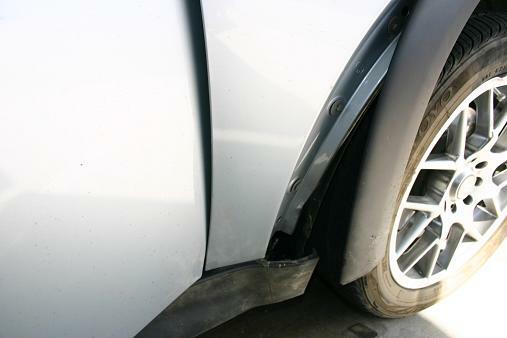 You can prevent skids by driving slowly and carefully, especially on curves. Steer and brake with a light touch. When you need to stop or slow, do not brake hard or lock the wheels and risk a skid. Maintain mild pressure on the brake pedal. 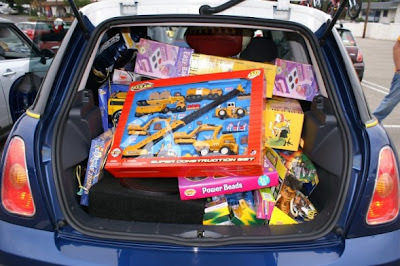 If you do find yourself in a skid, remain calm, ease your foot off the gas, and carefully steer in the direction you want the front of the car to go. For cars without anti-lock brakes, avoid using your brakes. This procedure, known as "steering into the skid," will bring the back end of your car in line with the front. If your car has ABS, brake firmly as you steer into the skid. While skids on wet pavement may be frightening, hydroplaning is completely nerve-wracking. 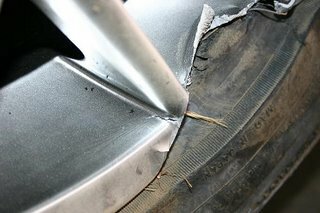 Hydroplaning happens when the water in front of your tires builds up faster than your car's weight can push it out of the way. 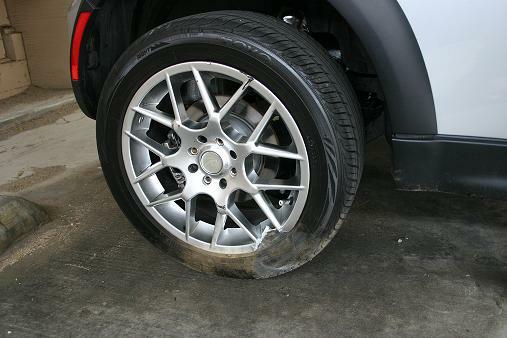 The water pressure causes your car to rise up and slide on a thin layer of water between your tires and the road. 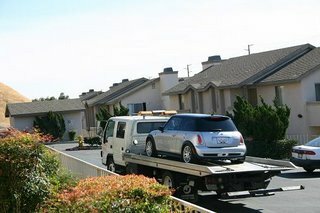 At this point, your car can be completely out of contact with the road, and you are in danger of skidding or drifting out of your lane, or even off the road. To avoid hydroplaning, keep your tires properly inflated, maintain good tread on your tires and replace them when necessary, slow down when roads are wet, and stay away from puddles. Try to drive in the tire tracks left by the cars in front of you. If you find yourself hydroplaning, do not brake or turn suddenly. This could throw your car into a skid. 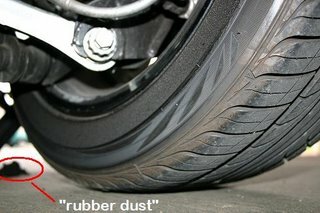 Ease your foot off the gas until the car slows and you can feel the road again. If you need to brake, do it gently with light pumping actions. If your car has anti-lock brakes, then brake normally; the car's computer will mimic a pumping action, when necessary. A defensive driver adjusts his or her speed to the wet road conditions in time to avoid having to use any of these measures. Reprinted with permission from the National Safety Council. *Borrowed from: The Weather Channel? Who knew?!! 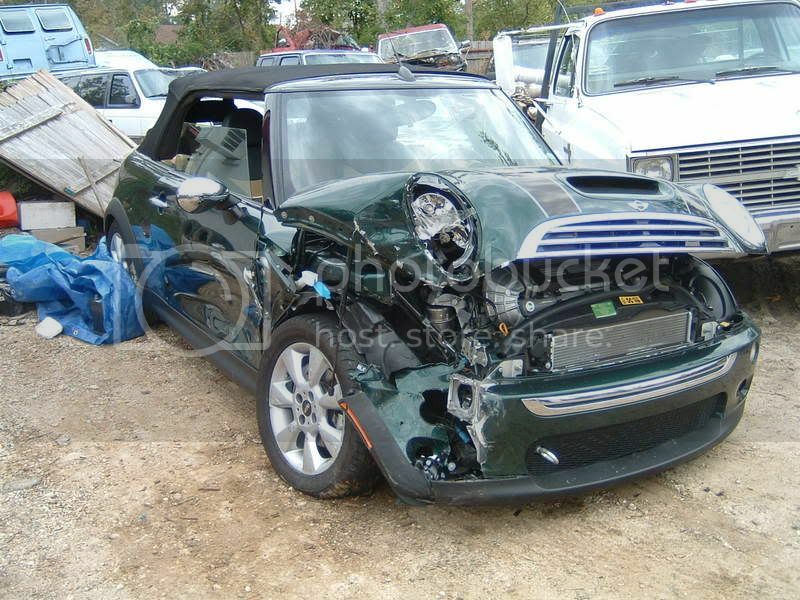 In the owner's own words, "...As you can see from the last pic, the crumple zone did what it was supposed to do, the passenger compartment protected me and I was not injured. Nor was the driver of the other car, thankfully. 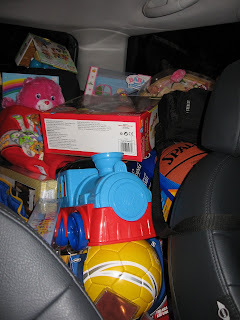 I was making a left turn on a four-lane highway and was behind a large truck, so I could not see very well. We had a green light, but we did not have the green arrow, apparently. He made it, I didn't. 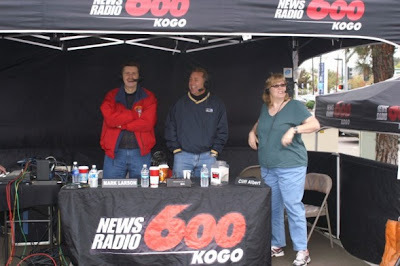 I was given the ticket...."
Okay- say it with me: OOOOWWWWWWCCCCCCCHHH!! !